First Listen: Kirk Franklin returns with a "Theory"
(February 11, 2019) When Kirk Franklin introduced The Family to the music industry, he brought a new attitude to gospel choirs and ensembles and a new dimension in how they communicated God’s praises. Besides The Family, God’s Property and 1Nation were extensions of Franklin’s seamless ability to shift the choir from the back to the foreground and make them shine in the process. Finding opportunities to extend his artistic personality behind the recording scenes, the multi-tasking producer and musician would occasionally dare to bridge the secular and gospel lines, including playing a major role for Snoop Dogg’s gospel project in 2017. However, whatever the controversies might be or might have been, Franklin’s zeal to keep it real for God continues to be the primary focal point in his ever evolving ministry. After a four-year absence following his Losing My Religion CD, Franklin returns with a gospel roar in our First Listen feature, “Love Theory.” And Franklin successfully fires on all cylinders with his electrifying choir propelled by his trademark emphatic adlibs, capped by clever lyrics illustrating the essence of God’s greatness: “He saved the day/He will come through/He won’t doubt/That’s not what super heroes do.” The supporting video delivers winning visuals, especially the spellbinding dancers on the streets and the grocery store aisle that connect with Franklin’s overall vision for “Love Theory.” All in all, his return to the recording fold is a joyous ride that stirs up a seventies smooth soul vibe with subtle modern touches. 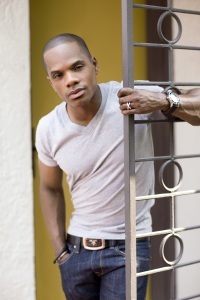 Kirk Franklin - "Love Theory"